It is a curious book indeed that posits the need for a change to the world’s dominant economic system from someone who readily and repeatedly concedes he is not an economist. But former Ogilvy Worldwide Creative Director for Motorola Simon Mainwaring’s central insight is grounded in the kind of thing that a marketing guy would think of. For we are in the business of creating desire and demand. And on a global scale, rightly or wrongly, the trappings of Western European/American Culture are the images of success that the world chases after. Whether we’re talking about the skyrocketing prices of Impressionist paintings or the re-creation of European capitals in the Chinese countryside or the on-going appeal of Coca-Cola regardless of geography, demography or era, it is Western European/American icons that the world desires, and by extension, the lifestyle that permits the attainment of those things. In other words, if everyone tries to achieve what people like Mainwaring – and us – have been telling them for decades they should achieve (setting aside whether we were right to tell them to want to achieve those things in the first place) the planet will collapse. There simply aren’t enough cows to supply all the steaks, enough gasoline to power all the cars, enough land to build all the houses to hold all the TVs. The challenge with proposals like these is often, no matter how well-intentioned or even valuable, the blind eye they turn to the very basic role of business. Businesses are in business to make money. They are not in business to give it away. And yet corporations are often looked upon as being vast coffers of lucre, who, if they only loosened their grip a little, could make the world easier for all of us. Thus in the future the line between companies and consumers – between buyers and sellers – is much grayer. It is a future driven as much by economics as it is by social media. A future in which “us” and “them” is a much more difficult to identify. 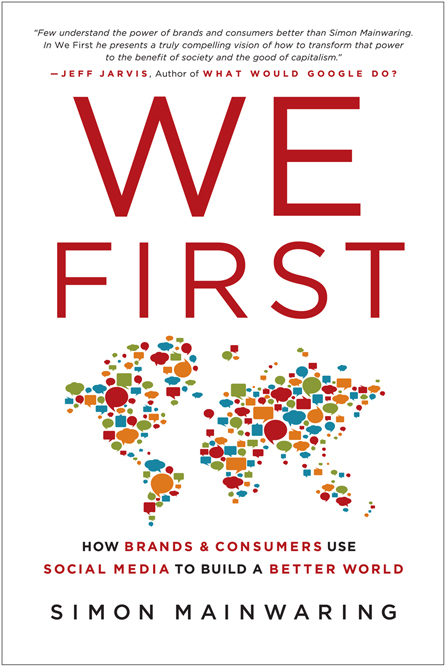 We First: How Brands & Consumers use Social Media to Build a Better World by Simon Manwaring was published by Palgrave Macmillan on 06/07/11 – order it from Amazon here or from Barnes & Noble here – or pick it up at your local bookseller (find one here).